She was breaking him. After all, love is war. I am at a complete loss of words as I am attempting to write a review for Breaking Him by R.K. Lilley. I was in slight anticipation for the release of this novel, yet I cannot tell you exactly how I feel about it. I mean the story of Scarlett and Dante transcended time and was lasting but it wasn't always in the sweet romantical sort of way. Scarlett was a fighter, because she had to be. Just like Sofia from The Color Purple, Scarlett had to fight all of her life. This was the case until she met Dante, who was always ready to fight for her ever since they were in the fourth grade. Now, Breaking Him was the first book in this series and took us to the past to show us how the relationship between Dante and Scarlett grew as they continued to grow as individuals. Their love was so innocent and pure until you are left bereft, confused, desolate and wondering what in the heck happened when the story thrusted you to their present day. I can easily say hate is a word that is too simple to capture the feelings between Dante and Scarlett as it seems that they have survived over the years with brief rendezvouses and competitions to see who can inflicted the most pain on the other. Love is definitely war between these two and when I read the last page I was totally discombobulated. I didn't know how to feel or think and actually asked myself, what had I just read. I thought about it, I re-read some chapters, and thought about it some more and after a few days had past, I was still thinking about it. I was thinking about all of what was missing and how I didn't know how to even feel about it, but then I started hypothesizing about what was to come in the follow-up novel Breaking Her, and then it hit me. I had yet another book hangover over a book that was all over the place and dropped me off on the corner of somewhere and over there, which was all courtesy of R.K. Lilley. I digress. I enjoyed Breaking Him by R.K. Lilley. Did I love it? Not quite. But what I did enjoy about it, was that there were some real emotions evoked by this story, from love to hate to a whole bunch of stuff in the middle, but anticipation for the second book, Breaking Her, was the strongest emotion. 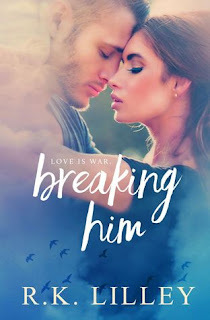 Overall, I will give this one 3.5-stars and would recommend that you jog on over and read Breaking Him by R.K. Lilley, you will not be disappointed, questioning, but certainly not disappointed. 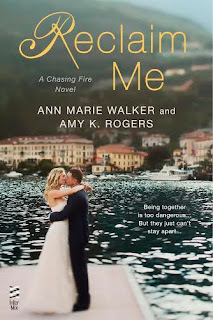 Reclaim Me by Ann Marie Walker and Amy K. Rogers, picked right back up where Release Me, book two of the Chasing Fire Series left off, where we were left with a major cliff hanger shrouded in mystery, revenge, and blackmail. I must say that I was excited to read the conclusion of Hudson and Allie's love story that transcended over time, but I found myself getting lost in the story. There was a lot going on, somethings endearing, somethings slightly here there and everywhere, but nothing that would say it was good or bad. However, I did enjoy getting to know a sober Nick and to take witness of his budding romance with Harper. 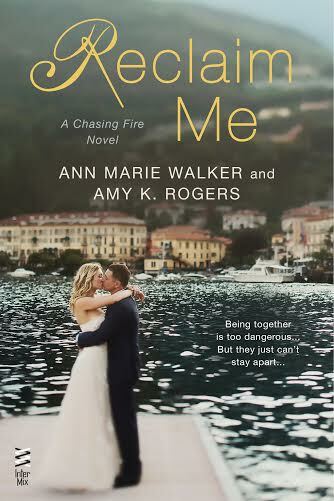 Overall, I honestly, cannot articulate how I feel about this third and final book of the Chasing Fire Series, Reclaim Me by Ann Marie Walker and Amy K, Rogers. I am glad that the love between Allie and Hudson persevered through time and drama and plain 'ol everyday nonsense and for them to get their very own HEA. So, if I had to rank this one I would give it a solid 3-star rating and would recommend anyone who is a fan of Allie and Hudson and happy endings, to skip on over an read Reclaim Me by Ann Marie Walker and Amy K, Rogers. Besides, you could not have read books one and two of the Chasing Fire Series and not read the third and final installment.